Sprinkler nozzles, also referred to as spray nozzles, are an important, but often overlooked component of well-designed irrigation systems. The proper nozzle ensures accurate, even delivery of water in the pattern you need. 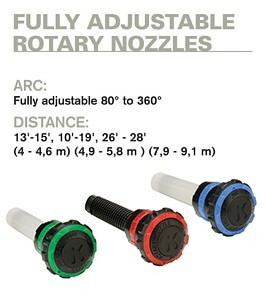 K-Rain offers an assortment of nozzle options for any lawn sprinkler system — adjustable, fixed, specialty nozzles, and revolutionary Rotator nozzles.